Violent crime in England and Wales rose by 6% in the third quarter of last year, according to official figures. There were also 10,670 firearm offences recorded by police in the year to September, up 500 on the previous year. Ministers said the violent crime figure was affected by changes to the way police record the crimes and pointed to a 6% fall in all crimes recorded. But Conservative leader Michael Howard said the rise in violent crime confirmed a "dreadful trend". He said the government's law and order efforts were failing. Ministers say the British Crime Survey, which is based on interviews with 40,000 adults, is the most reliable indicator of where crime is heading. The survey suggests violent crime is 36% lower now than its 1995 peak. With law and order set to be a key election issue, Liberal Democrat home affairs spokesman Mark Oaten said far too many people were victims of violent crime. He warned the government's plans for allowing pubs and bars to open around-the-clock were a "recipe for disaster" amid increasing alcohol-related violence. Mr Oaten also called for tighter restrictions on the sale of replica firearms and more controls on guns coming into the UK. Downing Street said violent crime figures now included lower level offences such as "pushing and shoving". It stressed there were no injuries in half of the incidents. Home Secretary Charles Clarke said driving down violent crime would be his "number one priority". He added: "I make no apology for getting violent crime reported or for changing the way it is reported because that is what we need to do." The recorded crime figures showed the first annual fall in the number of murders since 1996. There were 858 deaths initially recorded as murder - down 18% on the 2002-2003 figures - or 2% if Harold Shipman's crimes are excluded. Sexual offences recorded by the police increased from 13,900 in July to 17,000 in September. But officials said an overhaul of sexual offences laws had changed the way such crimes were counted. The government says the chances of being a victim of crime are the lowest for more than 20 years. Home Office Minister Hazel Blears said: "It is very encouraging to see that crime is continuing to fall. "Compared to the peak of crime in the mid nineties there are now each year 1.4 million fewer victims of car crime, half a million fewer victims of violent crime and 600,000 fewer households burgled." 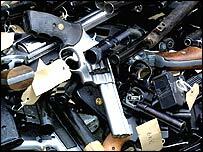 The gun crime figures included a 48% increase in the use of imitation firearms between last July and September. Serious injuries from gun crime fell 5% and the use of handguns was down 15%. Chris Fox, president of the Association of Chief Police Officers, called the overall fall in crime "hugely encouraging". New anti-social behaviour laws had helped the police tackle problems such as alcohol-fuelled disorder, said Mr Fox.